Curious about the history of Fordham University? Enjoy a ‘blast from the past’ and read on to find out why both The Washington Post and the Times Herald featured articles about Fordham University on February 16, 1962. On February 16, 1962 the Washington Post and Times Herald both reported that Fordham University rejected a student appeal for the return of football. Fordham University’s football team first took the field in 1882, and during the 1930s and 1940s crowds of 50,000 people filled the Polo Grounds and Yankee Stadium to watch the Fordham Rams football team. 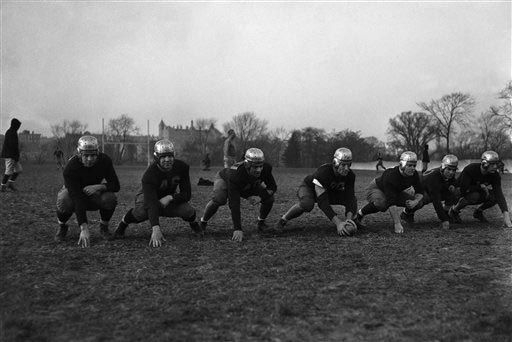 Fordham University suspended the football program for three years during World War II; the Fordham Rams last game before the suspension was November 28, 1942 at Yankee Stadium. Although fans believed that the University would revive the football program after the war the college officially dropped the sport in 1954. In February 1962 the Washington Post and Times Herald reported the University’s administration rejected a student petition to bring back football “on a smalltime, non-scholarship basis.” However two years later , in 1964, Fordham University bought back football on the club level.